What Are the Advantages of Privacy Louvers? 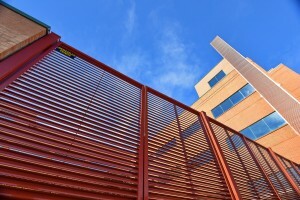 Privacy louvers may be the security solution your commercial property has been looking for. For business owners and commercial properties, sometimes privacy is essential. Your property doesn’t want to seem uninviting necessarily, just professional and buttoned up. You may also just need to create an obvious visual distinction between your property and surrounding residential communities or even just other businesses. If you’re looking to really establish privacy on your commercial property, look no further than privacy louvers installed by Hercules Louvers. Don’t let the nomenclature fool you: just because they’re called privacy louvers doesn’t mean people won’t see them. In fact, privacy louvers are known for their sleek, modern design that offers a certain professional aesthetic that can’t be found elsewhere. Whether you have clients and customers coming in or you just want to make the area around you look nicer, louvers are a great way to do so. They’re also a fantastic alternative to fencing if you want something that’s sturdy but still promotes airflow. Fences have their uses and are great, but they lack the unique essence that makes louvers so interesting to look at. Setting yourself apart in any market is difficult due to competition, but louvers are a basic, easy way to make your property stand out. Not only do privacy louvers make your property aesthetically appealing and private, but this has some pretty big security benefits as well. Think about it—typical fences are easily scalable unless you invest in some high-security fences. With louvers, this is much less a concern, as they limit visual access to your space and diminish the possibility that anyone will even want to enter your property. Not to mention you won’t have to perform any regular maintenance or do any upkeep work, leaving your property secured for longer. This entry was posted on Friday, September 7th, 2018	at 5:06 pm	. You can follow any responses to this entry through the RSS 2.0 feed. Both comments and pings are currently closed.